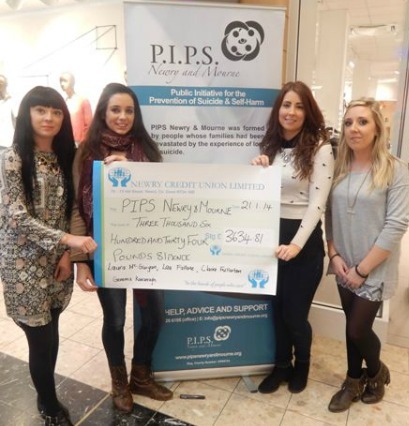 Laura McGuigan, Lea Fallone, Gemma Kavenagh and Claire Fullerton - Four local girls from Newry held a Night Out at The Races in Bellini's August 2013, and raised a total of £3,634.81. They would like to thank everyone who helped and donated money for their night out and help make it possible. They completed their skydive in Sept 2013 and had the best experience of their lives. PIPS Newry and Mourne would like to thank all of the girls on their very kind donation.